Trekking in Himalaya is always lifetime experience, mixed feelings, strenuous but in the end a wonderful experience with lots of memories. 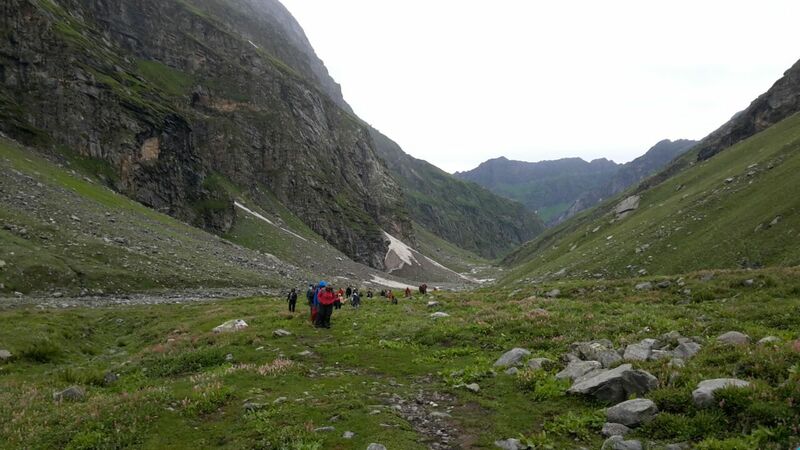 The scenic landscape changes its nature gradually offering a visual delight to the trekkers. The horizon is filled with the infinities of the sky and a unique tranquility surrounds the atmosphere. You can hear the sound of the wind and feel the true power of nature which is otherwise lost in a hustling city life. All you feel at that moment is completely 'humbled' in front of Mother Nature. The route of the Hampta pass through delightful alpine pastures, snowfields and offers magnificent views of peaks such as Mount Indrasan (6221 meters), Mount Deotibba ( 6001 meters ) and the other side of the valley known as the Spiti Valley in Lahaul District. The trail has a rich flora and fauna with forests of cedar, fir, walnut, oak etc. and colorful birds. Temperature Day time : 10 C to 15 C. Night: 5 to -4 C.
Best Time May to June & August to October. Terrain Scree slopes with rocky terrain. Arrival at Manali. After meeting the trek coordinator, proceed to the Hotel. Introduction and Briefing about trek. Overnight stay at Manali in Hotel. Woke up early in the morning to catch a taxi or jeep to Hampta Dam which is the starting point of our trek after finishing the breakfast. From there it is a gentle and beautiful climb, although some trails are bit tricky to cross. Get to see Beautiful views Pine Forest, Rock faces & Trees like Maple, Walnut, Fir, Oak on the way. We will start our trek from Hamta Dam and halt at Chikka. The first day Campsite at Chikka identified by big boulders and Beautiful Waterfalls. You will reach campsite by evening. Mesmerizing views of the Dhauladhar range. This range also has some beautiful waterfalls and lakes along with the icy-cold water. 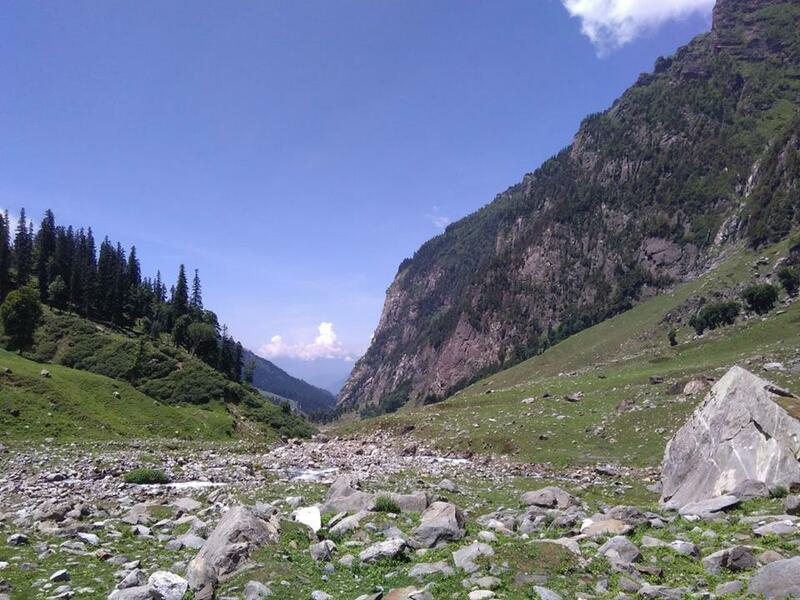 The second-day trek will take around 4/5 hrs from Chikka to Balu Ka Ghera which is at 11,900 ft.The initial part of the trek would be through the bank of the river through the rocks. 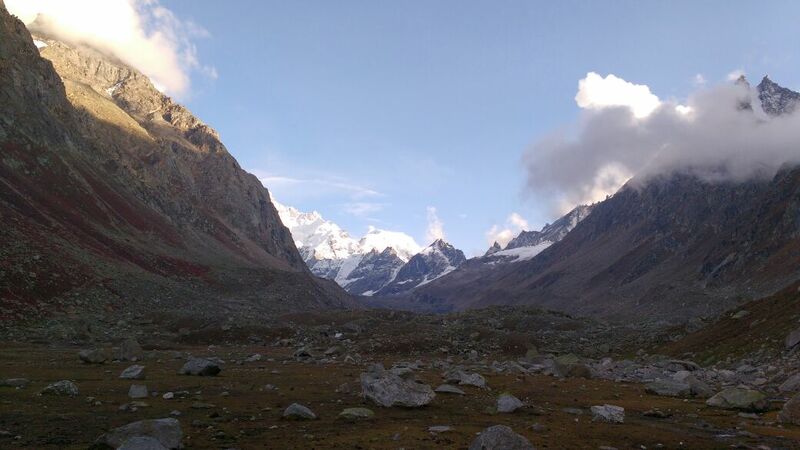 During the trek, you will start seeing "Valley of Snow". Balu Ka Ghera is actually a large plain ground on the bank of the river and camping at this spot is a dream for everyone as the whole place is so picturesque and breathtaking. Once People reach the campsite they will relax at the campsite. On the 4th day, the trekking will begin from Balu Ka Ghera towards Shia Goru via Hampta pass. This day's climb was a crucial one. 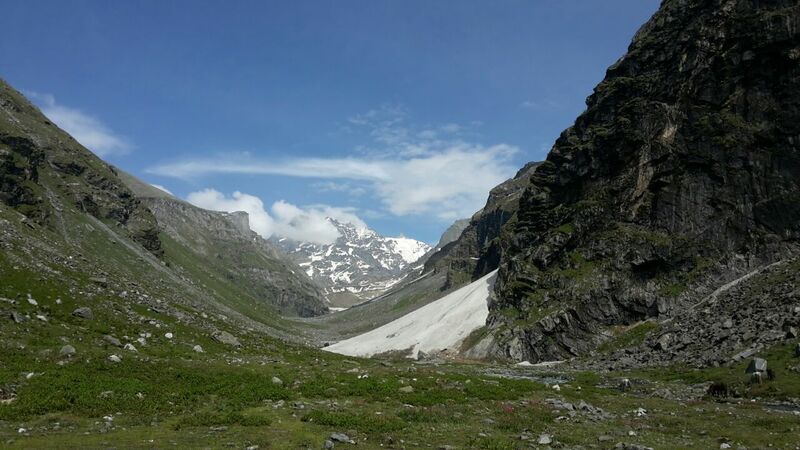 The trail now began towards the Hampta pass with Deo Tibba and Indrasan in view, along with a large view of Lahaul Valley. It takes around a Minimum of 4/5h to reach to the top of Hamta Pass. Then start descending from Hampta top towards Shia Goru. The descent is steep in times of abundance snow one could slide down to reach base Shia Goru. The 5th-day, people would head towards Chatru which come closer towards the road.One would get to watch the beautiful valley of lahul & spiti. The Mountains of Pir Panjal & Spiti ranger adds beauty and creates a magical view which continues till Chatru. Chatru is basically Meeting Point of Path From Rohtang Pass, Hamta Pass & Spiti. Then we will go for Chandra Tal with a jeep. Myth says that "Yudhishthir" the Oldest Panadva Was Called to Heaven from here. Camping for the night at Chatru. Jeep rides from Chatru to Manali. Departure after 4 pm From Manali. We will move early in the morning from Chatru after Breakfast for Manali. The ride to Manali is very Scenic.One will come across the famous "Rohtang Pass" on the way.It takes around 3/4h sometimes to reach Manali. So we will start by 7 am from Chatru by Lunch time we will reach Manali. Trek end here with sweet memories !!! Departure from Manali to Delhi. - Travel from Delhi to Manali. There are three ways to reach Manali from Delhi. By Air: The nearest airport from Manali is Bhuntar which is approximately 50 km from Manali. Air India operates flights between Delhi and Bhuntar. By Train: You can take a train to Pathankot, and then a narrow gauge train to Jogindernagar, from where Manali can be covered by road. By Road: The distance from Delhi to Manali is approximately 550 km and the journey requires 12/14 hours. Seats in private Volvo buses can also be booked online. Tickets on buses operated by the Himachal State Road Transport can be booked from ISBT. The last govt bus leaves at 9.30 pm from ISBT Kashmere Gate. Manali to Delhi. Tickets can be booked online at www.hrtc.gov.in.